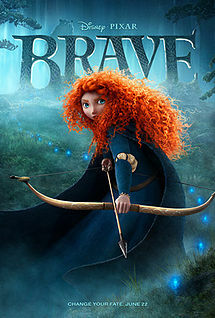 Yesterday I went to see the movie, Brave, with my granddaughter, Sami. It was my idea, but she agreed it was a good one. After loading up on popcorn, candy, and soda (I hope her mom doesn’t read this!) we nestled in our seats, ready to be entertained. When Merida first came on the screen, and I saw that mass of curly red hair I thought “That’s Zoey from my book!” Of course, the clothes and Scottish accent quickly brought me to my senses. I think I’m drawn to redheaded heroines. Some of my favorites: Madeline from the books by Ludwig Bemelmans; Anne of Green Gables, from the books by Lucy Maud Montgomery; Pippi Longstocking, from the books by Astrid Lindgren, Annie from the Broadway musical Annie; and of course the perennial favorite Raggedy Ann. There are a few who are hard to put into categories: Jean from the X-men movies; Jessica Rabbit from the movie Who Framed Roger Rabbit; Poison Ivy from the Batman movies; Lucille Ball from the I Love Lucy shows, et al; and Lindsay Lohan from her Parent Trap movie days. I can’t help but wish she had stayed so young and innocent. Looking back at my past, I realize that I’ve always wanted to be a redhead with green eyes. When I learned about psychics, I wanted that gift, too. And there were times I wanted to be brave, but chose the easier path. I guess that’s why my heroine, Zoey, has all those attributes. She’s made all my dreams come true. ← How Do Writers Get Their Ideas?